Warren Miller Entertainment has made sliding down a mountain into cinematic passion for 65 years. The latest film is No Turning Back, and photographer Court Leve, who recently relocated to Bend, has lent his vision and camera skills to the film, which spans the mountains of Europe and the U.S..
Greece, Japan, Switzerland, France, Norway, Montana, Colorado and Alaska all make the A-list. And Leve shot the latter for the film, having spent the past five years in Cordova, Alaska at Points North Heli-Adventures shooting from the glacier carved peaks on the southeastern side of the Chugach Range. Building a photography repertoire with Points North, Leve naturally moved into shooting stills for Warren Miller when the acclaimed ski and snowboard film company made its Alaska rounds, stopping to film the spines and steeps of the Chugach. His ski ability and artistic vision put him side by side with Warren Miller's videographers, but not always in the most comfortable positions. "You jokingly say 'where is the worst place to stand?' And it's probably the best place to shoot—nine out of 10 times it's the best camera angle," says Leve. "You don't want the skier to be a dot, so it's finding that balance." But dicey slope positioning may be just one part of ski filming and photography—add a 50-80 pound pack full of camera gear including two cameras (Leve sets one remotely with a trigger), a sheer slope angle, variable weather conditions, and the instinct for that right moment, and it ups the ante. This is not free skiing. "What these athletes do is extremely high consequence," says Leve. "I've been in places where if you're not confident and not feeling it, it's not worth it. And the number one thing to do is go with your gut. Sometimes it's that slow motion moment—the silent moment when everything slows down." 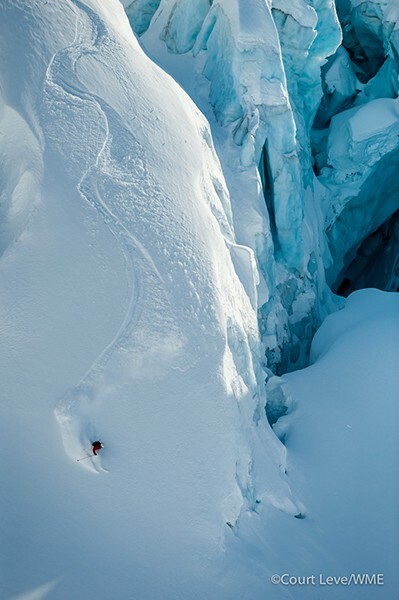 Like other locales Warren Miller films, Alaska defines challenging, or as Leve calls it, "unforgiving." Rock, bergschrunds, crevasses, avalanches, and often, only heli visibility for scoping lines, makes the Chugach intoxicating terrain. And for the cast and crew of Warren Miller, it's a place not to make mistakes—the pure definition of a no-fall zone. "If you drop a lens cap in the parking lot, it's a lot different than losing it up there," says Leve. Each winter Leve spends two weeks to two months skiing and shooting with Points North. But his resume reads a number of publications. Voted "Best Photographer" in the Lake Tahoe-Truckee region in 2010, Leve's has been published in National Geographic Adventure, Powder, Ski, Skiing, Freeskier, Parade Magazine, and The New York Post. Originally from Missouri, Leve has spent the past 13 years in Tahoe, and since a recent mountain bike trip in Oakridge, is now making Bend home. "It's been an honor to work with Warren Miller and to be a part of it is awesome—to be involved with the athletes and the Alaska experience are equally as important," says Leve. "The athletes are so successful and humble and down to earth. To be around them— to grow up in Missouri—and to be around these amazing athletes, I'm asking 'what am I doing here?'" plays at the Old Stone Church, Nov. 13-15.